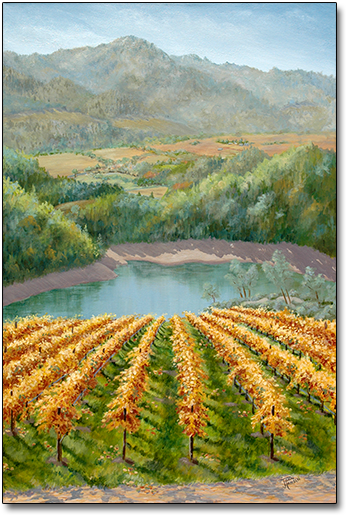 This acrylic painting was created after visiting the beautiful Viader Vineyard in Napa Valley. The grapes had been harvested, and the vines turned a golden hue. Limited edition giclée prints come with a Certificate of Authenticity and are signed and numbered by the artist. For more information on the giclée process, click the link below. This painting is available in two formats: the original painting, and as a limited edition giclée. The original painting was created on a gallery-wrapped canvas. The image extends to all four sides of the canvas. There are 200 signed and numbered and 40 artist's proofs in the limited edition. When you make your selection, click on the Add to Cart button to finish your purchase. Free shipping for the original painting! A. Price: 36 x 24"
F . 24 x 16"
G . 24 x 16"